WASHINGTON — Slap your cheeks and scream all you want, film snobs. The general public has long since overruled the 54 percent on Rotten Tomatoes. It’s time we stop calling “Home Alone” a guilty pleasure and embrace it as a film history classic. That’s right, someone had to say it. The official proof comes this weekend as the Kennedy Center — yes, the most esteemed cultural gatekeeper in our nation’s capital — presents the film’s 25th anniversary with live accompaniment by the National Symphony Orchestra and The Choral Arts Society of Washington on Nov. 27-28. It’s hard to believe this month marks 25 years since the film hit theaters in November 1990. Yours Truly was just 6 years old — the perfect age to admire Macaulay Culkin’s 8-year-old hero — so forgive the nostalgic review when I say I’ve never seen an audience convulse with such laughter. People were literally falling into the aisles during the booby trap sequence, an insanely fresh premise at the time. 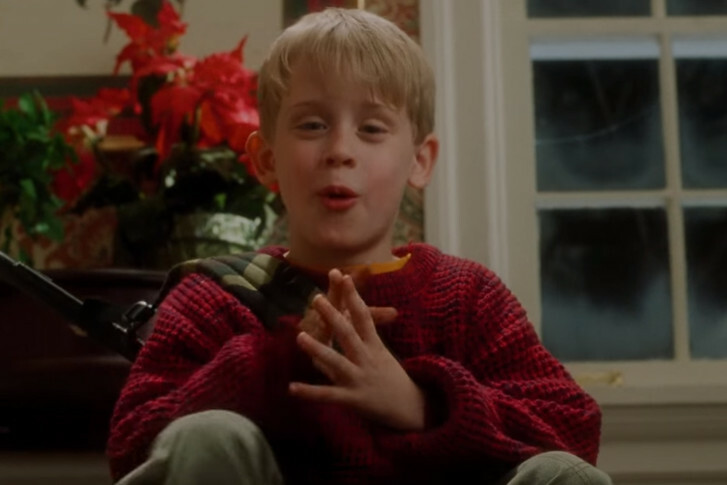 The rest of America was equally obsessed, making “Home Alone” the highest grossing movie of the year at $285.7 million domestically, trouncing “Ghost,” “Dances with Wolves” and “Pretty Woman.” To this day, it remains the 39th top grossing film of all time (adjusted for inflation), ahead of classics like “Pinocchio” (1940), “Cleopatra” (1963), “Beverly Hills Cop” (1984) and “Goldfinger” (1964). Take that, Bond. The name’s Hughes, John Hughes. How quickly we forget the genius storytellers involved. In order to full appreciate “Home Alone,” it’s time we take a step back for a little role playing. Imagine, WTOP listeners, that we’re Hollywood film producers setting out to make the ultimate holiday family entertainment. To start, we’ll need an original premise that’s never been done before. How about a crowded Chicago family accidentally forgets its rebellious son at home alone during the holidays, allowing him to discover the importance of family after an attack by two bumbling burglars? Sounds like a winner. Who should write it? How about Hughes, a proven voice for ’80s youth angst (“The Breakfast Club”), household gadgetry (“Ferris Bueller’s Day Off”), family hi-jinx (“National Lampoon’s Christmas Vacation”) and the stress of holiday travel (“Planes, Trains and “Automobiles”). Can you image if Hughes could combine all of these elements into the same movie? Well, he did. Perfect. But even superb direction won’t matter if we don’t cast the protagonist just right. We’ll need someone who can handle the comedy of the booby traps, the action of a shoplifting sprint across an ice rink, and the heartfelt emotion of Old Man Marley in a church pew. How about the sarcastic Macaulay Culkin? Fresh off “Uncle Buck” (1989) and “Jacob’s Ladder” (1990), Culkin will surely skyrocket into one of the most famous child stars of all time, right up with Shirley Temple, Judy Garland, Mickey Rooney and Elizabeth Taylor. Hell, we may even get a sequel out of him. Bonus. Great. But we’ll need talented grown-ups to play his parents. For the father, let’s go with John Heard, a favorite of Penny Marshall in both “Big” (1988) and “Awakenings” (1990). For the mother, why not Catherine O’Hara, who shared an Emmy for the TV sketch comedy “SCTV Network” (1981-1983). Tim Burton cast her in both “Beetlejuice” (1988) and as the voice of Sally in “The Nightmare Before Christmas” (1993), showcasing the dark comedy we need for her to shout, “Kevin!” O’Hara will sell her soul if it means getting home to her son. She’s maternal instincts incarnate. Career role potential. Wouldn’t it be nice if we could give O’Hara a “guardian angel” like Jimmy Stewart had with Clarence in “It’s a Wonderful Life?” Instead of giving him wings, let’s give him a brass band as The Polka King of the Midwest! Who better than John Candy, O’Hara’s colleague on “SCTV Network” and Culkin’s baby sitter in “Uncle Buck?” After all, Candy has depicted holiday travel stress in a Hughes movie before after he and Steve Martin tried desperately to get home for Thanksgiving in “Planes, Trains and Automobiles.” Such inspired casting would showcase Candy’s giant heart in one of his final roles. This thing is really coming together! We’ll definitely need some memorable antagonists to really sell it. How about Joe Pesci, the same year’s Academy Award winner for Best Supporting Actor for Martin Scorsese’s “Goodfellas?” He’ll make the perfect “clown” who “amuses” us, though he’ll have to tone down his profanity, replacing it with family-friendly gibberish: “Fridgle fradgle.” Oh, and let’s name him Harry Lime, an homage to Orson Welles in Carol Reed’s “The Third Man” (1949). We’ve got a surefire classic on our hands! But wait, Pesci can’t do it alone. These baddies would work best as a buddy-comedy team. Let’s add the gifted-as-hell Daniel Stern, fresh off classic supporting roles in Peter Yates’ “Breaking Away” (1979), Barry Levinson’s “Diner” (1982) and Woody Allen’s “Hannah and Her Sisters” (1986). He’ll make the perfect goofball to Pesci’s straight man as The Wet Bandits in “Home Alone” and the Sticky Bandits in “Home Alone 2: Lost in New York” (1992). Wow, this movie is really going to be special. What would finally cement this flick in a class of its own? How about an Oscar-nominated score by history’s most legendary film composer John Williams. Sounds like a recipe for a holiday movie classic. Maybe one day it’ll play at the Kennedy Center. Beyond these cartoonish elements, it’s the touching holiday music that really make this thing sing. Not only does it feature a killer pop soundtrack — Chuck Berry’s “Run Rudolph Run,” The Drifters’ “White Christmas,” Brenda Lee’s “Rockin’ Around the Christmas Tree,” Southside Johnny’s “Please Come Home For Christmas” — Williams also weaves traditional holiday themes into the score. Still, the cream of the crop is “Somewhere in My Memory,” which earned the film its second Oscar nomination for Williams (music) and Leslie Bricusse (lyrics) for Best Original Song. “(It) has become a classic Christmas song done by choruses all over the world,” Reineke says. You honestly can’t listen to that tune and not feel good inside. Thus, “Home Alone” has become as much a part of the holiday season as decking the halls and trimming the tree. It will exist as long as Christmas is celebrated, airing annually alongside “It’s a Wonderful Life” (1946), “Miracle on 34th Street” (1947), “A Christmas Story” (1983), “Christmas Vacation” (1989) and “Elf” (2004). Click here for more information about the event. Listen below for the full interview with Steven Reineke.